This little angel flew down to earth a little over a week ago... While my sister and I brought to life three little vivacious boys, it took one of my little brothers to bring a precious baby girl to this world. Gracie's coming gave me my first opportunity to give back to my siblings some of the amazing support they've offered me as a new mom and Auntie. I especially wanted to "give back" some of the amazing help my sister, Becky, gave me to help me transition into motherhood. From role modeling amazing motherings skills as she first walked the road of motherhood, to endless phone sessions coaching me through pregnancy, to two amazing baby showers, to help decorating my nursery, to holding my hand while I labored, to cutting Bryles's cord, my sister became my mentor and closest friend. Later, as I struggled with the enormous changes of motherhood and tremendous feelings of overwhelm, my sister again tried to help me through tough moments. Her experience as a mother for three years before I could claim that title were invaluable to me. I vowed early on that I would someday try to offer such support to another new mom... It wasn't long until one of my brother's gave me just such an opportunity. When I found out Steve and Kathy were expecting I immediately focused all of my crafting activities on their soon to arrive little one. I found Betz White's pattern for a cashmere puppy , sat Bryles on my lap and started sewing. While we worked, I told Bryles all about the cousin he was about to gain. He happily helped me work, and from that day forward he made every art project a gift for Auntie Kathy's baby. Later, my sister and I got together to make plans to give Kathy a baby shower. We both adore Kathy and have always especially appreciated her as she is the driving force that keeps our brother Steve connected to our families. Kathy ensures that they visit frequently and that they send our boys thoughtful holiday and birthday gifts. This is a role my sister and I often play in our husband's lives, and we just loved that Kathy shares our family-centered values. We were eager to return some of the love she's "showered" on us by planning the most fantastic shower ever. In one of our first adult collaborative projects, Becky and I got our boys playing while we hand made ellaborate shower invitations, and planned new mommy games. Later, I used a Princess Lasertron inspiration to sew a dozen recycled sweater flowers as one of our party props. Each activity gave me a chance to make something I tried to infuse with love and blessings for Kathy, Steve, and their new baby. Shopping for the new baby girl also became my favorite obsession. There is nothing so heart warming as picking up a tiny pink outfit or finding some hand-made flowery object to add to a baby girl's nursery. Erin Hallinan's flower pennants were just one of the things that found their way into the basket of items I amassed for my soon to be niece. When Kathy's shower date finally arrived, I again found myself reflecting on how becoming a parent brings people together. From Kathy's mom, to her sister, to my sister and me, to the dozen other ladies that showed up arms laden with gifts, I could see that all of these moms shared my desire to help welcome Kathy to the world of mothering. Mothering is all about giving, and we all felt inspired to give Kathy some of the love she'd soon be pouring out in her own role as mother. We were more than happy to spoil her with her favorite cupcakes, flowers (from Dragonfly Floral! ), and gifts. Besides, welcoming a new mom allows veteran moms to recall their own children's birth. Smiles and tears flowed freely at this shower! While it was once my parents who brought my siblings and me together, it is the experience of parenting that now connects us. Holidays, first tee ball games, and - of course - births give us new occasion to come together, celebrate, and support each other. It's a magical thing to watch my little brother hold his new baby and transform into a father. Kathy and little Gracie are also now permanently bonded to our family. I am blessed that my sister and brothers remain an active part of my life, and I am honored to serve as Auntie to their beautiful, spirit-filled children. I look forward to every new occasion that brings us together! Happy first day of Spring, dear friends! Monica Ashley, local mother and designer provides us with a lovely visual for the sweet spring season that bounds off today - a Spring Table featuring a felted Peter Rabbit and colorful Easter eggs. 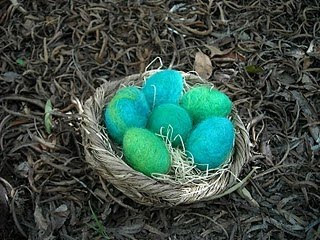 Monica crafted Peter using wool roving and felting needles, while she formed her festive eggs by wet felting wool. You, too, can learn to craft such whimsical creations through one of Monica's felting courses - visit her blogspot often for information about upcoming classes! Bunnies and eggs aren't the only signs of spring. A blanket of color now covers our garden floor, and blooms are ready for picking. Monica used her talents for mixing colors and textures with these garden beauties as well, crafting beguiling arrangements for the tables at Summerfield's recent Farm Dance fundraiser. Take your child's hand and head outdoors to discover Spring for yourselves. Remember to take a basket to gather a few treasures for your family table. On Saturday March 20th, community members came together to create the 10th Annual Cesar Chavez Day Health Fair at Roseland Elementary School. Embracing Cesar Chavez's "Si se puede" ("Yes we can") legacy, local non-profit leader CalSERVES coordinated a spirited and colorful event engaging hundreds of local community members, service organizations, and AmeriCorp volunteers. Sponsored by First 5 of Sonoma County, Kaiser Permanente, St. Joseph's Health System, Redwood Credit Union, and Community Action Partnership, this community festival embodied a spirited message of health, fun, and community. Children flocked to the Sonoma County Free Bookmobile to select books to take home, gathered near the Roseland Children's Health Center booth for healthy snacks, and carted home free plants to start their own family gardens. Some sat still for a haircut and climbed into a dental chair for a check up. Parents visited information booths shaking hands with Sheriff's Department representatives, getting on the spot job counseling and educational guidance from SRJC staff, or support from the Women's Initiative for starting entrepreneurial businesses. The Community Childcare Council also welcomed parents, offering help paying for childcare or selecting quality preschools. Health advocates offered giveaways and activities for families. Kaiser promoted physical activity with an obstacle course, First Five Sonoma County passed out parenting kits (complete with videos, resource guides, children's books and other materials to support their "While We Play, I Learn" campaign), and Safe Kids Sonoma County raffled off a crib while promoting healthy sleep for children. Children took part in a bike rodeo, zooming around cones while learning about safe biking practices such as wearing helmets. YMCA staff handed out balls and information about swim lessons, sports teams, and the Sonoma County After School Network. Santa Rosa Recreation, Parks and Communities offered copies of the Santa Rosa Activity Guide and guides for setting up COPE (Citizens Organized to Prepare for Emergencies). 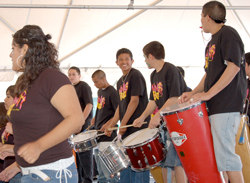 As crowds milled about exploring community resources, entertainers such as Windsor Bloco put on a raucous show. The rhythmic beat of the preformers' drums and feet added to the upbeat aura of the fair. While fair participants represented a range of ethnic backgrounds, ages, and community roles, the message of "yes we can come together to improve our community health" resounded in the bright smiles of all involved. Do you have memories of your Grandpa telling tall tales of sly foxes or speedy rabbits by the fire? Did you grandmother cast you in the role of “Helpful Chick” as she played “Little Red Hen” and baked bread? While children often associate such memories with laughter and fond memories of a beloved adult, stories have long wielded a unique power as a parenting tool. Through her four to six week workshop series, de Croes affirms stories offer a captivating means for guiding children, allowing adults to move away from less effective measures such as scolding. Importantly, telling stories meets children at their developmental level by using imagery, humor, archetypes, and often physical engagement (e.g. hand gestures or finger play) as instructional aids. As parents and other adults craft stories for children, a “shared imagination” develops between them. This sharing, also builds strengthened relationships. Add a story to a wind down time in a family’s day, such as naptime or bedtime ritual, and the stories additionally add calmness and deepen closeness. Parents enrolled in Moved by Story’s workshops quickly buy in to the idea of tucking story telling into their parenting tool belt. Often frustrated by their children’s response to scolding or discussion about behavior and their own tendency to feel exasperated, annoyed, or agitated while delivering a verbal reprimand, stories offer an interesting alternative for guiding behavior. Although a story’s delivery may be best reserved for a time when children are ready for listening – which may not always be immediately following a behavioral incident – parents can employ storytelling as a fun, engaging way to communicate values such as sharing, patience, honesty, and other virtues to their children. Waldorf Educators like Marianna de Croes believe children live in the world of imagination, and find storytelling as a powerful pathway to engaging the child’s developing consciousness. Building on the Waldorf pedagogical theory of ages and stages, de Croes helps parents work with their own voices and gestures to tell age-appropriate stories. For example, children from birth to 5 years old respond well to simple stories, which may feature synchronized hand motions or short songs. Storytelling styles change as children grow up, a concept explored more deeply in the Moved by Story workshops. Moved by Story helps parents learn stories and storytelling techniques in a relaxed and fun setting. Instructor Marianna helps parents bring an element of ritual to the process by offering tips for creating wind down or bedtime routines. Lighting a candle, picking a cozy spot (e.g. at the dinner table, near the fire, or in bed), and beginning and ending stories with special phrases, are all calming activities which serve to ground both children as listeners and the parents as tellers. To join or sponsor a workshop contact Marianna deCroes at storyed@gmail.com; cell (707) 494-8990 land line (707) 829-5035. For more information see www.movedbystory.blogspot.com. 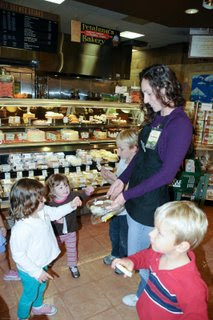 Last week, Whole Foods Petaluma hosted a special field trip for 40 Old Adobe School first graders. Led by teachers Ms. Brown and Ms. Stoep, the children engaged in a community classroom experience complete with cooking lessons, a worm composting demonstration, and a store tour. The field trip also included a tour of the Petaluma Whole Foods Market. 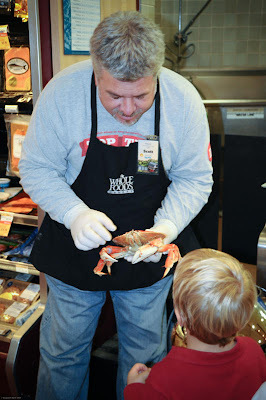 Gaining a new perspective of a grocery store’s functioning, one excited student exclaimed, “The freezer is big enough to walk into!” The students additionally learned about Whole Foods’ environmentally friendly measures, including careful packaging choices and pesticide prevention. Student quotes such as “if the plastic crinkles its trash” or “the organic food grown without chemicals does not ever touch the food grown with chemicals” reveal some of the first graders’ broadening understanding. With Whole Foods' outstanding leadership and generosity, local children learn important life values such as healthy food choices and environmental protection measures; but it isn’t a just the kids who benefit. “Hosting these tours and activities brings such a warmth and joy to our team members. It gives us a chance to show people that we are more than just a grocery store, we are a community,” observes Melissa. 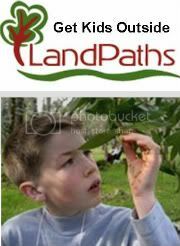 Interested in coordinating your own worm composting demonstration or school worm bin? 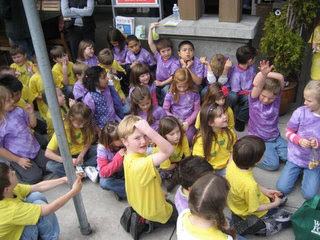 Contact the Sonoma County Master Gardeners at (707) 565-2608 to find out how they can help your school. Taking on such a project requires a classroom commitment to feeding the worms and maintaining the soil (students feed the worms leftover scraps, toss in bits of recycled paper for bedding, and water frequently). Heidi Stewart also reminds school groups, "The worm box does need some small amount of maintenance during the summer, so of course can't be left in the class with the rest of the supplies!". She suggests a family volunteers to take the bin home over the summer. Those who want to try worm composting at home, can let the Summerfield Waldorf High School student Alliance for Climate Education group (a recent benefactor of Whole Foods Sebastopol’s Enviro¢ents program) teach you how to build a bin (video below). Download the full project at: acespace.org/toolkit. Start a Worm Compost Bin with Summerfield Waldorf High School Students from ACE Space on Vimeo. 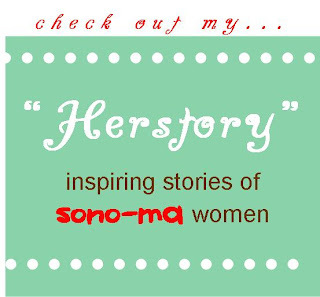 Sono-Ma Celebrates National Women's History Month with "Herstory" Contest & Fabulous Prizes! While recording national achievements is import to help society value women's contributions, Sono-Ma knows it is often the unnoticed smaller deeds of women that shape our lives. Do you have a story you'd like to share about a woman who shaped your "herstory" (feminist word for history)? Share your story with Sono-Ma and help acknowledge the act of the many "everyday divas" in our lives. The winner will be announced on Mother's Day weekend (May 8th, 2010 at 4:00 pm), so gather your thoughts and leave a comment soon! Using the comments link on this article, write up to 200 words naming the first name of the woman you'd like to recognize and detailing her contribution or inspiration in your life. Include your first name and email and url if you have one. Leave your comment/submission by May 1, 2010. Optional: Use the "attach photo" option if you like to attach a .jpg of your choice (including .jpg's of documents e.g. recipes, artwork, or other creative submissions you can squeeze into a .jpg). Sono-Ma will select the most compelling story after May 1st and on or before May 8th, 2010. 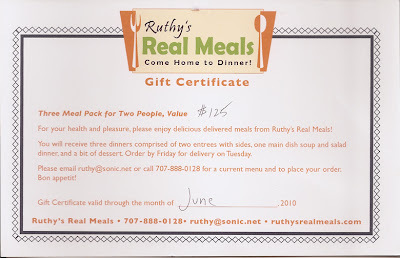 If the winner's inspiring woman lives in Sonoma County, she will receive by mail a gift certificate to Ruthy's Real Meals valued at $125. If the winner's inspiring woman lives outside of Sonoma County, the winner will be mailed $75 in gift cards to Applebee's restruarant. Thanks in advance for telling "herstory" - we count on each other for inspiration! Rainy days may keep families indoors more often than usual. Families can make the most of this time with a good craft and science experiment, and why not choose an activity that reflects the wet season? Build a frog or toad house with your child and let the adventures unfold. 3. If the ground is not consistently moist in this area, consider making a small "pond" out of a shallow dish of water or by burying an old yogurt container in the ground and filling it with water. 4. Wait. "If you build it, they will come." It can take a day, week, or a year, but they will come! (You can always make a paper jumping frog like this one from Craftzine.com to test out your frog habitat until a live frog checks out the real estate.) We added "toadstool" mushrooms - a sure frog favorite - to decorate our dwelling and add to the fun. In between running out to the garden to see if your new froggy friend decided to move in yet, snuggle up on the couch with a few good frog books. Singing Frogs is a certified "Bee Friendly" and "Beyond Organic" farm, and home to hundreds of frogs who live on the edges of the many reservoirs and creeks on the property. Join Singing Frogs this Sunday, March 7th or Saturday, March 13th from 10 am until noon for a fun, informational and very inspiring Tour of Singing Frogs Farm! The tour is free for 2010 CSA (farm share) members and $5 for community members. Sign up for your family's farm share and your tour fee goes toward your CSA membership. Call 829-1389 for more information. What better captures Springtime than images of fluffy, white bunnies, fuzzy, yellow chicks or a lamb first finding his legs? Children love these baby farm animals, which call to the hearts of all young and old. Whether your family connects with Spring's babies through visiting local farms, crafts, and books, opportunities abound for welcoming the coming tender season. What better way to see baby farm animals than at the farm? 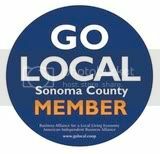 Sonoma County is home to hundreds of local farms who welcome you and your family to visit. Singing Frogs Farm, run by a young Sebastopol-based family, raises chickens and sheep and is home to the famous Charlie the Llama. Join Singing Frogs - a certified "Bee Friendly" and "Beyond Organic" farm - this Sunday, March 7th or Saturday, March 13th from 10 am until noon for a fun, informational and very inspiring Tour of Singing Frogs Farm! The tour is free for 2010 CSA (farm share) members and $5 for community members. Sign up for your family's farm share and your tour fee goes toward your CSA membership. Call 829-1389 for more information. Sonoma County Farm Trails welcomes you and your family for a special farm tour event "Blossoms, Bees, and Barnyard Babies" on April 18th from 11-5. Your ticket purchase earns you a behind the scenes tours of local farms and artisan food production as well as tasting and on the farm experience for you and your family. Parents can experience Summerfield Waldorf School's bio-dynamic farm in high style at the upcoming Farm to Feast event - check the school's website for "Day on the Farm" events designed to engage small children. Love Farms in Healdsburg (1069 Grove Street - call ahead to arrange a visit at (707) 473-0943) sells Ostrich eggs in the Spring. You can buy an Ostrich egg today for just $20 at Love's soup shop in Downtown Healdsburg at 126 North Street ((707) 433-6274). Some families gold leaf these giant eggs and hide them as the most treasured find in family egg hunts! 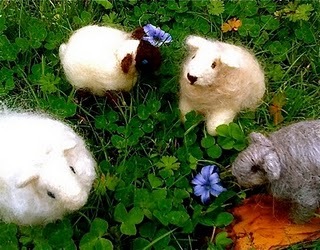 Felted Nest Workshop: Beginners felting class for just $15. Saturday, March 13, 2010; 1:00 pm - 3:00 pm. Call Cast Away at (707) 546-9276 to reserve your space today! Sweater Bunnies. Learn to make a "bunny softie" through this Craftzine.com "how-to" or check out Sono-Ma's 2009 Oester post for a simpler sweater bunny pattern and picture. Pom-pom chicks. Check out Martha Stewart's Daffodils and Pom-pom Chicks! Bunny Books. I am a Bunny , Peter Rabbit , So Many Bunnies , and Guess How Much I Love You or Charlotte's Web for the older or more patient child. Monica Ashley also suggests the Country Bunny and the Little Golden Shoes . Farm Animal Books. Farm Animals and How Big is a Pig? Children of the Forest .